Jian Xuan Oolong (known as Milk or Silk Oolong) is a Taiwanese Oolong that has a distinct aroma that developed due to the growing climate and conditions. The other day I had the pleasure of steeping some Jian Xuan from eLTea, a small local tea company in Fresno, California. Hands down, the first thing you notice is the aroma. To me, it simply smells like butter or buttered corn on the cob. The appearance is, like most other oolongs, leaves that are tightly curled when dry. The water temperature I used for steeping was 190 Fahrenheit (87 Celsius), and steep time was 2 to 3 minutes. The liquor is almost a sunflower yellow. The taste is unique; milky and a light creaminess that has a wonderful sweet rounded taste at the end. I got about five steeps before noticeably loosing flavor. 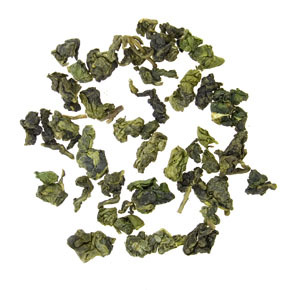 My verdict on Jian Xuan Oolong, it’s an aromatic and easy tea to like. For me, it’s a constant reminder of a 4th of July Picnic and buttery corn. I think this would also be a good tea to introduce to people just getting into tea, though I did notice that it left my mouth a little dry. You can order Silk Oolong at eLTea, and be sure to friend them on Facebook. This entry was posted on September 1, 2010 by Jordan M. Williams. It was filed under Tea Reviews and was tagged with eL Tea, Jian Xuan, Milk, Milk Oolong, Oolong, Silk, Silk Oolong, Silk Tea, Tea.